Click HERE to view the Voter’s Guide for the Board of Education. Click HERE to view the Voter’s Guide for Wood County Candidates. Click HERE to view the Voter’s Guide for US House. Click HERE to view the Voter’s Guide for the US Senate. It is going to be a busy time leading up to the Primary Election in May. We are uniting with Mountaineers for Progress to sponsor three candidate forums. Doors for the forums will open at six, the forums will last 6:30-8:30 p.m., and there will be refreshments after each forum. The first forum will be for the County Commission and the Board of Education Candidates. It will be held at 6:30 on Thursday, April 12, at WVU White Hall (Room G-09), 135 Willey Street. Since this is a new venue for us, there will be ushers to guide you to the meeting room. Parking is available by the nearby churches. The second forum, for District 51 House of Delegates Candidates, will be held on Thursday, April 19, at 6:30 p.m. at the Plumber/Pipefitters Hall, 100 Richard Drive. From the Greenbag Road, turn at the corner of Mountainview Elementary School onto Richard Drive. The Hall is on the right. There is plenty of parking. The third forum will be for Candidates for Congress, the 1st Congressional District. It will be held at 6:30 p.m. on Thursday, April 26, again at WVU’s White Hall (Room G-09) on Willey Street. Our league is very excited to be cosponsoring these forums with Mountaineers for Progress. Though it is a Primary Election in May, it will be the final election for the Board of Education. he final day to register to vote in the May Primary will be April 17. 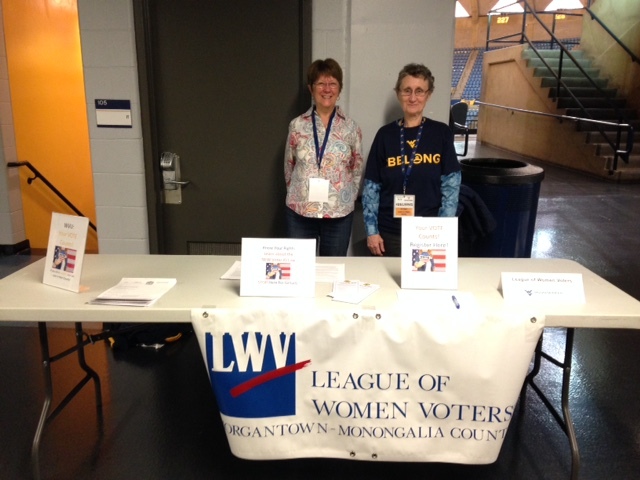 Our League will be hosting tables for voter registration at the WVU Library on Wednesday, April 4, 1-4 p.m. and on Thursday, April 5, 9.a.m. to noon. https://monongaliacountyclerk.com and click on Primary Election Information. 2018 is shaping up to be an interesting year. As you probably know, the new Voter ID law went into effect on Jan 1, and the League has been working with many other groups locally and state-wide to be sure that voters are prepared when they go to the polls in May. The law is very flexible, giving many acceptable ways to identify oneself, including having someone with an ID certify to your identity. You can help by reminding people of the change, and if you would like some “rack cards” to distribute, we have plenty. There is still a lot of news about potential disruption of elections by outside entities, but we have been reassured that the Mon County system is secure. Voting machines here are not connected to the internet, so the only way to interfere with them would be to attack the physical machine. If you were able to attend our meeting in October with Mr. Kearsey from the Secretary of State’s office, you heard all the ways that WV is monitoring other aspects of our system, such as voter rolls, so that they feel comfortable that the integrity of our systems is strong. I had an interesting meeting with our County Clerk, Carye Blaney, who explained how they are going about “cleaning up” our voter rolls. Her long-range goalis to produce laminated voter registration cards which will have a barcode that identifies you, removing the necessity to sign when you vote. There’s still a lot of work to be done to make that happen. We are looking forward to our partnership with Mountaineers for Progress to hold three candidate forums, which are detailed in the newsletter. We are hoping that our partnership will bring a larger audience to the non-partisan events as we evaluate who we would like to represent us in the November elections. I encourage everyone to attend—you will get a lot of valuable information and insight into the candidates. As always, thank you for your support of the LWV Morgantown-Monongalia County, and we encourage you to join us at our monthly board meetings, the third Monday of most months at 4pm in the downtown public library. Also watch for more information on our Annual Meeting which will be held later in the spring. State Council will be held on Saturday, April 21, 10 a.m. – 3 p.m. at Morgantown Public Library in the upstairs conference room. Councils are held in the interim years between Conventions primarily for the adoption of a budget for the ensuing fiscal year. This year’s Council is generating significant interest because the Board is proposing lowering the state Per Member Payment (PMP). As a bonus, recently the Board of LWVUS announced they are waiving the student PMP until January 31, 2021. The Council is composed of the presidents of the local Leagues (or an alternate in the event a president is unable to attend), two delegates chosen by each local League, and one delegate from the state board. The morning session will be a normal State Board meeting which will include interesting Portfolio reports and discussion. Lunch will be held from 12 noon – 1 p.m. Meals will not be provided, but you are encouraged to bring your own lunch or visit one of Morgantown’s excellent nearby restaurants. Council will commence at 1 p.m.
After Council, the remaining time will be devoted to Legislation, beginning with special speaker Julie Archer, state board member and LWVWV lobbyist presenting what transpired at the Legislature this year. You can be certain that there will be a healthy discussion about the “No Constitutional Right to Abortion Amendment” and how local Leagues can take action to educate the public before the November election.